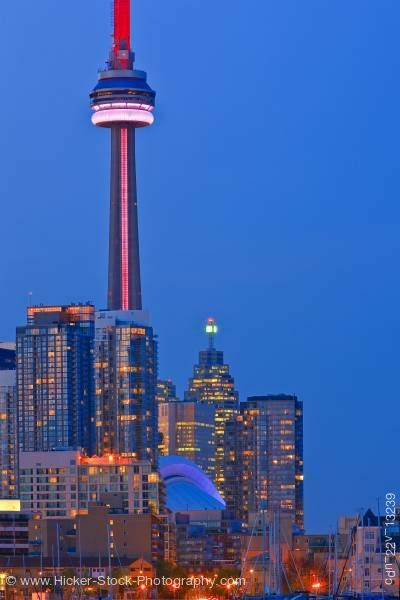 Stock photo of the CN Tower and many of the tallest buildings all lit up as the sky fades from deep blue to night as seen from Ontario Place, Toronto, Ontario, Canada at dusk. This stock photo gives you a close view of the City of Toronto's skyline as seen from Ontario Place, Toronto, Ontario, Canada at dusk. The deep blue sky that makes up the background is about to change to black and the CN Tower and other buildings are already lit up for the night. A new study on globalization has found that Toronto ranks as the world’s fourth best city to experience culture, behind only London, Paris and New York. The City of Toronto is the cultural, entertainment and financial capital of Canada. The city is home to more than 2.7 million people.